Uganda indeed deserves the tittle of being the Pearl of Africa as described by the British traveller who was on his Safari and tour to Uganda. Basing on the country’s unique attractions which range from natural, built up and cultural attraction which are spread out the country, I call upon both local and international travellers to book their safaris to Uganda because it’s the only one destination in Africa and the whole world one can visit and have a diverse memorable experience. 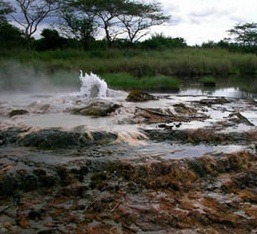 Safaris in Uganda does not only involve tracking primates, taking game drives, watching birds but it also includes experiencing the magical Sempaya hot springs located in Semuliki National Park. The interesting nice looking hot springs has a hole in the ground that shoots out hot water and steam shooting up from a distance of like 8m wide hole at hot temperatures. The hot spring is well known because it’s the only spring in the continent that is composed of both female and male hot springs. The most interesting part of the hot spring is that in its natural boiling water one can boil food such as eggs in only period of ten minutes and hence practical visitors should come with one or two eggs so that you can boil your own egg practically. The interesting hot spring’s hole located beneath the earth surface shoots out the hot water which also shows how powerful subterranean forces that are said to have shaped the Rift Valley many years ago. Besides experiencing the hot spring, visitors on Uganda safaris and tours are also rewarded by watching the primates like the chimpanzees, grey-checked mangabey as well as the red-tailed monkey, and other species like elephants among others all along the trail that heads to the hot spring. The memorable experience is gained more from having face to face encounter with the Batwa locals who are the inhabitants of the forest. Visiting the group of people in Uganda who are seriously disappearing and they occupy this particular part of the country is more rewarding to any Uganda safari undertaker. The long lasting impression comes from the unique cultural dances, drama ,art craft, and other traditional believes that visitors will have chance to see by their naked eyes.